My life so far has been a colourful twenty five years in that I've always got by, by doing a bit of this and that. I've cleaned primary school toilets to handing Kanye West his nail clippers, worked long hours at a greasy grill to handling thousands of pounds in cash doing one woman's personal shopping. I've been in utterly unglamorous working environments to the most surreal and magical. Not being adverse to rolling up my sleeves has kept me grounded. Being grounded is, and always will be, a true quality. I'm a creative, and find creativity in everything that I do. I may have been sweating over a grill at some point, but was still designing the menu boards. Learning from the inside out, working for other creatives, means that the time has come for the launch of my own 'thing'. It is with great pleasure that I announce E. R. Saloon, launching on the 26th March. E.R. Saloon will be an online destination for cult, selective and desirable clothing - vintage of course. You'll be able to shop to your hearts content, lust over paper thin T-shirts and dream about Levis denim. Sign up to the mailing list to be kept in the lasso (lol). I remember my infatuation with vintage clothing started at a young age. In primary school I wore one of my older sister's vintage Dr Martin T-shirts as my P.E kit. On the front it had a B&W photo print of two naughty looking grunge girls leaning against a brick wall. I was in year four, and completely misunderstood by everyone. In my last year of secondary school instead of wearing the supplied blazer as my uniform, I insisted on wearing a true 70s forest green velvet blazer. It fitted like a glove. Year eleven wasn't quite ready for this, and I'd often get laughed or threatened with being beaten up. I was labelled a grunger, goth, emo... and that was all completely fine by me. I relished rebelling. I'd find vintage completely mesmerising. The fact you could find a piece from decades past, that no one else was likely to have. What could be more cooler and special then that? Fast forward a few years, through my teens (spending time dying my hair every colour, sewing up my jeans into drain pipes and pretending I could BMX) to my early twenties; I landed a job as a Stylist for Topshop. This later turned into Junior Personal Shopper at the flagship store at Oxford Circus. It was here, that I inherited 'how to be chic' and my style refined itself. I learned how to update vintage style bringing it into current times. I spent my days in the dungeon of Topshop with some wickedly stylish women. There was a french Personal Shopper named Sophie Moureto, who was the epitome of chic, rock and roll style. She'd give Kate Moss a run for her money any day. Sophie, to this day, is a huge style inspiration for me - I've linked her blog, you must take a look. I learnt how to update my rebellious vintage approach and bring it into modern times. 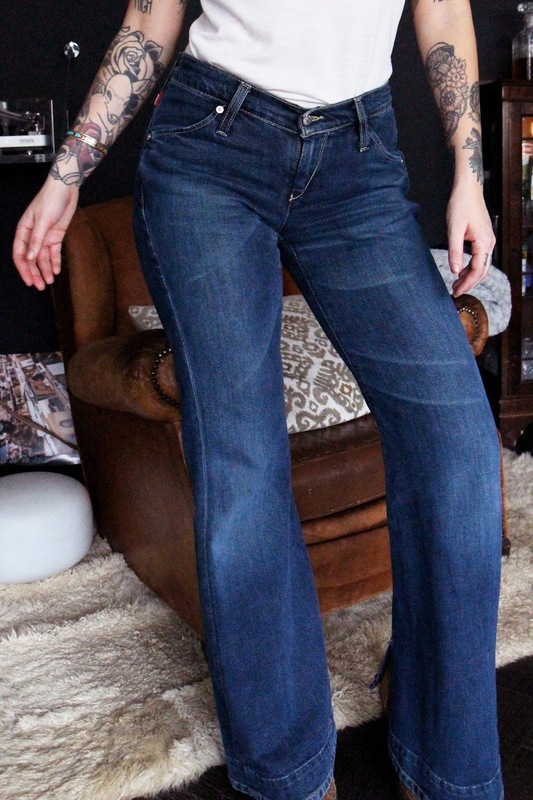 Mixing classic 60s/ 70s/ 80s pieces with up to date staples and so on. Being bohemian at heart, in the end I buckled under the rules and regs of retail but I'll always have Topshop to thank for this stylistic learning curve. So it's with this history lesson, that brings me back to the point of this post. I'm exceedingly excited for E.R. Saloon to be ready for you all to see. You'll be able to shop (this outfit above!) vintage T-shirts and denim to your heart's content. P.s - a young Robert Plant was my inspiration for this look, did you notice? Original 1970s LA Dodgers T-shirt by Champion and Low Rise Levi Flares - coming soon to E.R. Saloon. Online store opening 6pm, Sunday the 26th March.